The way we went from severe drought to record level rains and flooding is really something. Please continue to pray for balance for our Mother Earth and all of her inhabitants. It just doesn't feel right to do a normal newsletter right now so I thought we'd just send out a list of resources where you may be able volunteer your time or send donations or whatever feels right to you. They have a wide range of organizations who are providing assistance in many ways. They keep the site updated with new organizations and new needs too. Plus a direct line into Estes Park, 979-577-3974 to get help or to give help. Plenty of places to put forth any energy you are feeling compelled to offer. Read the full CBS story. "If you've got a car that gets old you get rid of it. You got a horse that gets old you feed it for the rest of its life." Read the full story at The Republic. 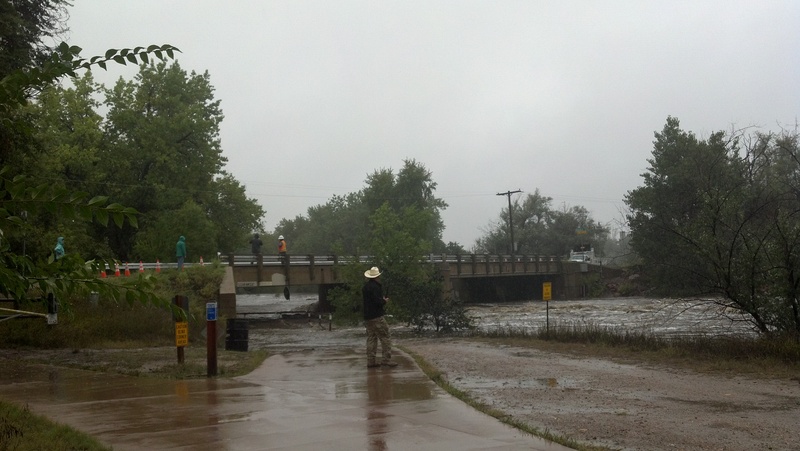 Engineers survey the N. Shields Street - Poudre River bridge, which is under attack by a swollen river. Larimer County engineers survey the Poudre River bridge on our northwest corner as it is battered by debris, most likely washed down from the High Park Fire area. The bridge is scheduled for replacement, and its center pylon is already damaged by previous water scoring. Engineers have monitors wired to the bridge, which keep them informed as to the bridge's health. So far, so good, they say. The river, which runs along our north border, is at about twice its spring melt levels, and has broken through to the gravel pond natural areas to the north. It has also flooded the Poudre River bike trail to our east, along the north border of the proposed Pateros Creek housing development. Cayla Stone and her horse, Cooper, watch the swollen Poudre River from the safety of our east pasture. 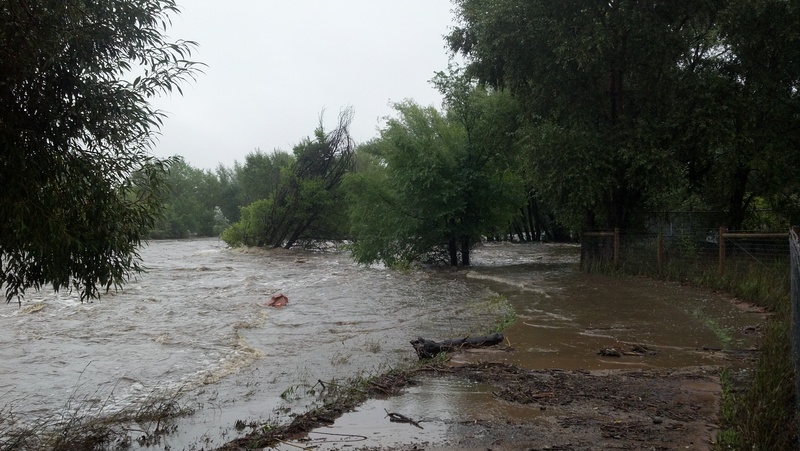 From our stable's north property line: The Poudre River has breached the bike trail underpass at N. Shields Street. Trees and other debris continue to whack away at the center pylon, but the bridge is holding. Road workers stand by, and tourists flock. All the horses are safe and happy on higher ground. In fact, from a rain standpoint, this is much better than the 1997 Spring Creek flood. What is hurting us now is the runoff from the mountains, which has nowhere to go but the river. A new bike trail is planned at this spot. Bring your surfboards! Fort Collins - Poudre River - N. Shields bridge. River has breached the bike trail underpass. Road workers blocking traffic.